Swift River fly fishing is unique. It is like fishing at an aquarium. Once you get the hang of it, though, it isn’t that tough. Troy’s overview below includes the best flies and best spots. You do not need a guide. If you are new to fly fishing, go to the Hatchery Pipe (overview here), which fishes well from July 1 to Dec. 31. The area below Bondsville is productive and faces much less pressure. Swift regular Gary Metras has a presentation on winter fly fishing. Also, most of the anglers who do well make their own flies. For specific patterns, certain nymphs, dries and streamers do well for me. Or, call Dan Trela. His flies really do work. I’d like to start off with an explanation and an apology. I’m sorry I haven’t posted in a week. I said earlier that I try to post every day, but I was in the hospital with pneumonia for a week. Fortunately, I got over it fairly quickly and am better now. So, without further ado, here’s my Swift guide…. The Swift is the most popular fly fishing destination in Massachusetts, with maybe the exception of the Deerfield: great scenery, many big fish, and it fishes well all year-round. But, it is also the most technical fishery in Massachusetts, and it can be a real challenge to hook the super-picky rainbows. With some research, you can find out a lot about the river, but, here, I am going to compile 15 years of Swift River fishing experience. Hopefully, I can give you access to everything you need to know to get out there and catch a bunch! This is a probably the longest post I’ll ever make. It focuses mostly on above the Route 9 bridge. Bear with me, and hopefully you’ll learn some new stuff about the Swift. First, if you have never been to the Swift, it is important to have a basic understanding of the river’s geography. When driving to the river, your best bet is to go to Route 9. 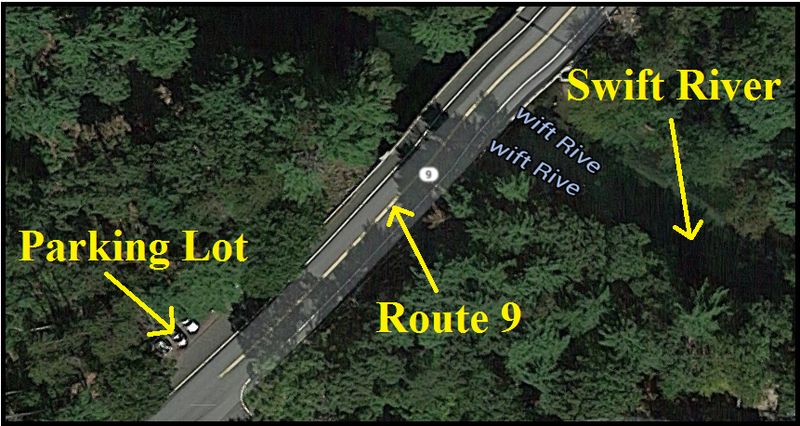 Route 9 crosses over the Swift, and there is a good-sized parking lot there, too. The Route 9 bridge also marks the beginning of the C&R section. So, once you get to the bridge, you have a big decision. Do you go upstream or downstream? 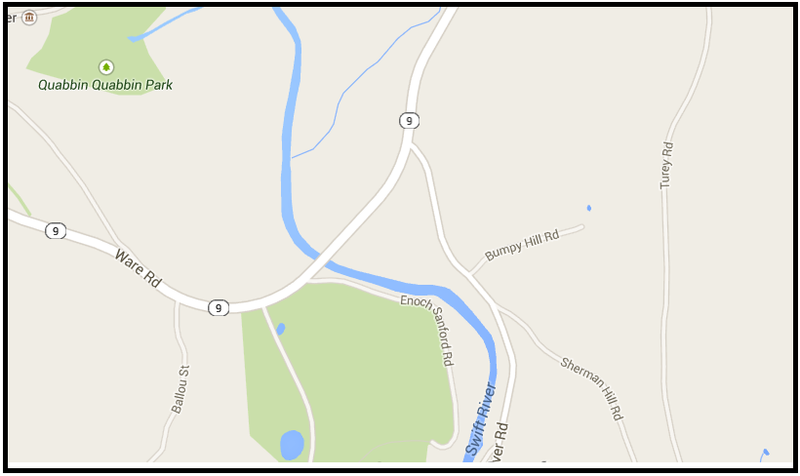 Above Route 9 is catch and release, fly fishing only, all year-round. Below the bridge, you can keep a limit of trout and use bait from January 1st to July 1st, but for the second half of the year, there is no bait or fish keeping allowed. However, spin fishing with artificials is allowed all year below the bridge. 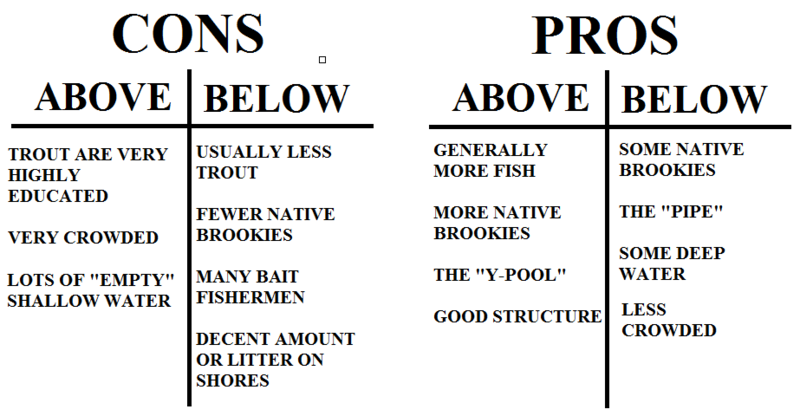 Here are a few pros and cons of each part of the river. I tend to fish above Route 9, as I usually find more fish there. However, many times (especially in the summer), you can find up to 30 fish hanging out right below the bridge, in the deep water. When this is the case, I will go downstream, because there is almost no walking involved, and I can squeeze in a lot more fishing. Plus, I like fishing the deep water. In the winter, I will usually peek off the bridge, and see if there are any fish. If not, I will work my way up to the Y-Pool. It is the most well-known spot. When you think of Swift River fly fishing, this is a classic image. It is the deepest part of the river, and is always home to loads of big trout. However, it is usually very crowded, and the trout here are some of the pickiest in New England. Tiny dries are usually hatching all year in the Y-Pool, but these are tiny. I’ll talk more about them later. The Y-Pool gets its name from the two arms that come out of it, forming a “Y”. 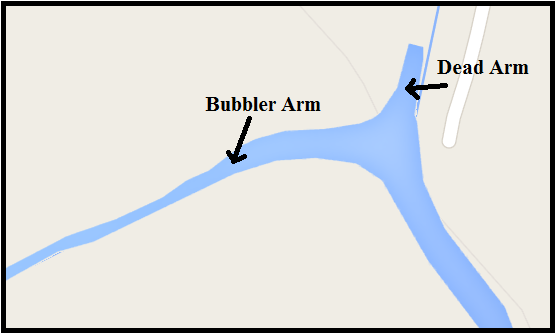 The arm on the right (if you’re walking up the river) is the “dead arm”. The water here is usually very still and is usually filled with spooky rainbows. Bugs are almost always hatching here, in the mouth of this arm. Trout can be found deep there, but it is pretty deep. So, plan on walking down the shore to get there. The other arm is The Bubbler. This is fast and always flowing because it drains from the Quabbin. Trout can be found in this arm almost always, but be careful of tough casting conditions. The sides of this arm are lined with bushes and trees. The trout can be tough to see in this water because it is fast, but a good pair of polarized sunglasses is super-helpful. The water right below the Y-Pool is the best spot for native brookies, as of now. They may move later, but right now, I would argue this spot is the best on the Swift. As you are walking up to the Y-Pool, you will see a fallen tree on the right side of the river, when you are right below the pool. Around this tree, I almost always see dozens of brookies. These brookies are a blast to catch and are almost always willing to bite. Now, I’ve talked a lot about the native brook trout in the Swift, but I haven’t really talked about the other fish. The Swift is loaded with big trout. It receives multiple stockings in the spring and the fall, mostly rainbows, but a few browns, too. Below the Route 9 bridge, fishermen can keep trout for half the year, so this depletes the population a bit. However, you should have no problem at all locating fish because the water is CRYSTAL CLEAR. In the spring and summer, if you walk up towards the Y-Pool, you can easily spot rainbows from the trail. But, in the fall, things start to get interesting. When it gets cold, trout often will often spread out and locating them can be a bit more difficult. Sometimes, in the winter, I don’t see any fish below the bridge at all, so, the best bet is the good ol’ Y-Pool. You will almost always find trout here, although, sometimes, trout have completely left the pool. If this happens, you just have to search. Trout like to school up in this river. If you find a deep section near the shore, it will likely hold up to a dozen trout. Also, the Swift is filthy with suckers. It’s not rare to see a 20-inch sucker sitting on the bottom, not really doing anything at all. While most people ignore them, they are a blast to fish for. Try drifting a really heavy nymph right in front of one’s face, and prepare for a fight! Make sure you have heavy tippet, as these will make quick work of 6x. They can look similar to a big trout, so have a close look if you think you see a 30-inch brookie! With these very spooky trout, having the right equipment is vital. A five-weight is a good all-around rod for the Swift, but if you are only targeting the native brookies, a three-weight will be fine. I would not, however, recommend using a three-weight for the big trout. You’re better off with a slightly longer, heavier rod, for fighting big fish and long casts. For leaders, I usually use a standard nine-foot 6x leader, with a few feet of tippet. If I’m fishing streamers, I’ll go with a 4x, but, for midges, I go with 6x. A long leader is VITAL for these cautious trout, and even more when you are fishing dry flies. I usually end my leader with 7x or 8x for midges, and 6x for soft hackles, eggs, and San Juan Worms. Before I get onto flies, it’s worth mentioning a few other pieces of equipment you need. Waders are a must on this river, unless you want to strictly fish below the bridge. The water is ice-cold and is not fun to wet-wade in. Also, bring a net as these fish can be BIG, and it is never fun to lose a trophy just as you get it in. All right, now for flies. Basically, there aren’t too many big hatches at the Swift, so trout mainly rely on midges for nutrition. Tiny midges are around all year-round underwater, and they hatch all the time, too. Now, these aren’t a major hatch, but trout are always rising for these TINY flies. Zebra Midges, Brassies, and any other sort of midge nymph is good for imitating the subsurface nymphs, from sizes 18 and beyond. I would say that generally, smaller is better, so a size 24 is a good bet. For the dries, tiny CDC dries are easy to tie and are deadly on Swift trout. A dubbed black (or white) body, a tuft of CDC, a size 26 or size 28 hook, and you’re all set! For those of you who can’t find hooks that small (they are really hard to find past size 26), go to flyshack.com. They sell all you good ol’ midges down to size 30. Now, there are strange exceptions at the Swift as far as flies. For some reason the trout here are suckers for big soft hackles, especially the Partridge and Orange. Really any soft hackle from sizes 16 to 20 will probably get some interest. Next, it’s worth mentioning that the best fly fishing in my opinion is during the summer, when terrestrials are out and about. It’s way easier to catch trout on a big size 10 hopper than on a size 30 midge and 8x tippet. Mouse flies can be very effective on the Swift, but I’ll discuss that in a later post. Dress warm. The Swift is cold already, but even colder in the winter. Bring toe warmers and neoprene gloves! Swift River fly fishing can mean standing in one spot for a long time. Bring your size 28s and 8x. There won’t be much hatching, and no terrestrials, so make sure you’ve got your midges. Go big or go home. Sometimes a big streamer will pull it off in the winter. Wooly Buggers and marabou smelt patterns are good choices. Salmon? Sometimes, salmon come over the spillway and are a blast to target. Bring some eggs and streamers. If you can’t see ’em, you can’t catch ’em. The beauty of the Swift is the clear water. Walk along the bank and look for trout before you start fishing. If you see nothing, turn around and head home. Suckers. They seem to “come to life” during the winter. If you can’t get a trout, maybe give those four-pound suckers a shot. Deep water. The trout will be in deeper water. And, last but not least, have patience. The Swift is slow fishing, but can be worth it if you stick with it! So, there you go, a basic Swift guide. It’s definitely worth hitting the river because of the scenery and big fish. Thanks for this extensive guide. I have never visited the swift because of the drive, but I may have to check it out, and with your guide I should be set to go. Just a quick question or two….what is the river like above the y pool? Does it become more rugged/scenic and hold more wild fish? Thanks again and I hope you get better. The river really ends at the Y-Pool. It splits off into the 2 arms, which both don't go far. The bubbler goes on for maybe 100 yards, to a spot where water drains from the Quabbin Reservoir. The other arm (with very calm water) goes on, for I'm not sure how long, but not too far. The river really doesn't move past the Y-pool. But if you are looking for a scenic spot with more wild fish, the very lower Swift down in Bondsville may be a perfect spot. I don't fish it too often (I'm hoping to fish it more next year), but it holds a lot of native trout and looks like a classic New England trout stream. I'm glad this came up, I'll definitely write about this section later. However, I don't know how it holds up over winter. I'll try to find out, and will let you know. And by the way, was the format of this post messed up? It was fine on my computer, but when I viewed it on my phone there were copies of paragraphs and stuff was out of order. I believe it's better now. Troy, yes, the format was a little messed up and some things were copied, but I was able to figure it out no problem. It is interesting that the river holds more wild fish downstream because it's usually the other way around. I look forward to a future post about that section. I did a little research and it seems as though Jabish brook (big trib) and the west branch of the swift both hold native brookies. 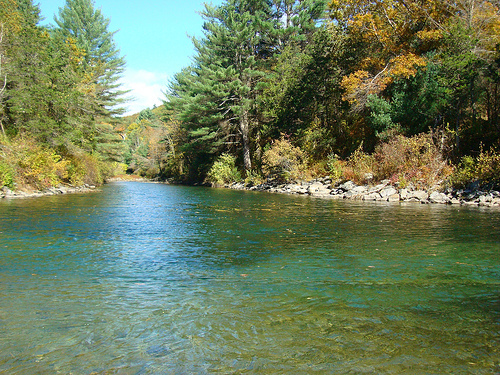 Have you fished either of these waters or perhaps the east branch? I would like to thank you for doing this blog, and I appreciate your posts. Jabish Brook is very good fishing. It is actually decently long, but I usually only fish right near where it meets the Swift. The West Branch gets a run of salmon in the fall (about a month ago), but I don't fish it often. I believe it has a decent population of trout as will, but you'd probably be better off at Jabish. And you know how I mentioned that small flies were a must at the Swift? Well, you can forget about that down in the lower Swift (in Bondsville) and Jabish Brook. Your average small stream flies will e fine. Thanks for the help. I will probably take a ride up to that area in the summer, and I will fill you in on how I do. It seems like jabish is a go, and if I want to catch some larger fish I will check out the lower swift too. Do you have a post on mousing the Swift? You say at the end for another time. I am thinking of making a trip. No. The author of that post moved and left the team years ago. A friend of mine has fished the Swift at night, including with mice patterns. Says it has been ok, not great.